1. 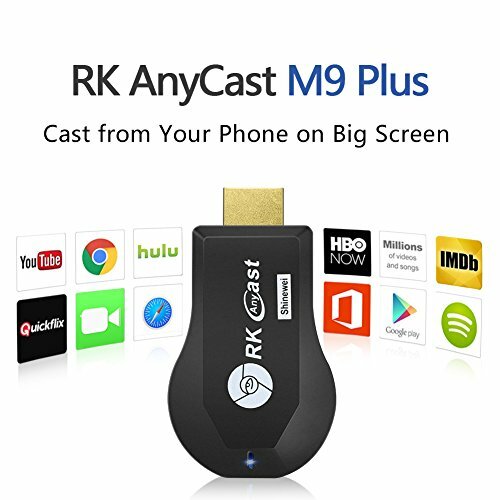 RK AnyCast M9 Plus wireless HDMI dongle has customized design which relaxes you from the tired daily life. 2. With Wireless Wifi Display Dongle, you can enjoy your favorite videos, photos and movies on the best display in the house. 3. Simply connect the tiny adapter to your HDTV and you can wirelessly display content from a compatible laptop, tablet, or smartphone. Anything you can see on your laptop or tablet, you can see on your HDTV. 4. Perfect for home or on-the-go, just take this TV stick with you to enjoy advanced technology. 1.This is the newest Anycast dongle. 3.It support Airplay, Miracast and DLNA protocols. 7.Support OTA wireless upgrade online. Wireless Wifi Display Dongle is ultra low power consumption, and low heat.With compact portable deign and easy carrying. Add to cart, buy it now! 【Stable Signal】: With the latest RK3036 chip (Dual Core), Wireless Wifi Display Dongle ensure your streaming stable and reliable. It is wide used in Business, Education, Family Party, Game Entertainment etc. 【Upgrade Function】: Screen Mirror Dongle is support Google Chromecast (Compare to other AM8252 and RK2928 chip). You can also upgraded the device online when new version released. 【Full HD 1080P】: With this Wireless Screen Mirror Dongle, you can stream video vivid and smooth, colors gorgeous and voices clear. Present PPT, Excel, Word, PDF, pictures and browser from the smartphone, tablet to the HD TV or beamer, Projector. You can create your own exclusive cinema, enjoy different audio-visual feast. 【Easy Operation】: No APP or drivers required. HDMI wireless dongle can start sharing with Miracast DLNA Airplay protocols. Notice: The dongle is better use external power adapter(better with 5V/1A). 【Wide Compatibility】: Shinewei HDMI TV Dongle is compatible with smartphones and tablets with Android, Mac OS X, iOS, Windows. With this Wireless display dongle, you can easy share high-resolution., you can easy share high-resolution. If you have any questions about this product by Shinewei, contact us by completing and submitting the form below. If you are looking for a specif part number, please include it with your message.